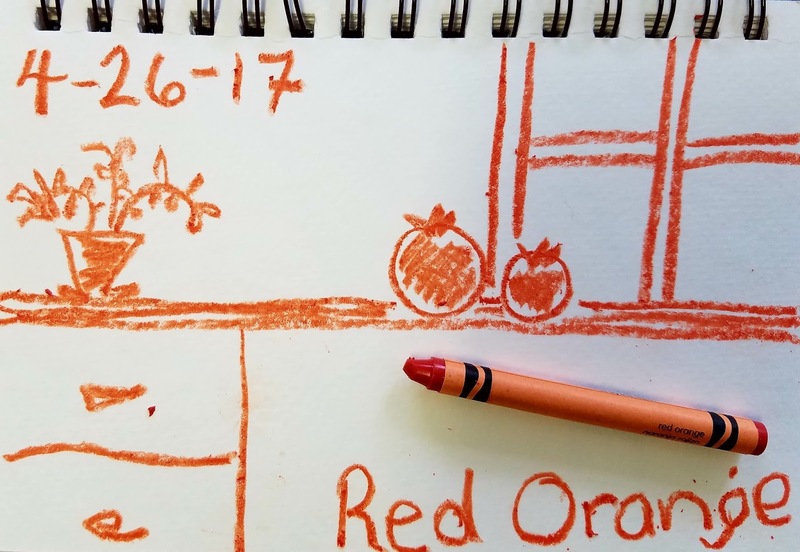 And now...today's crayon. Red Orange! Students - Today's poem takes us back twenty days, to April 6, our first visit to Miss Johnson's fire escape. 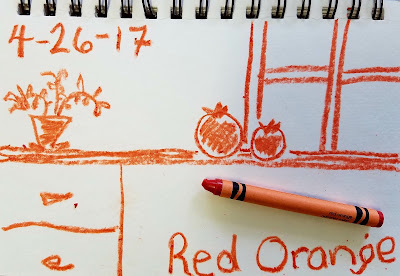 I was surprised to pull RED ORANGE from my box...and then I was tickled, as I realized that this color could connect with my YELLOW ORANGE inspired poem earlier this month. One truth about National Poetry Month is that it always makes clear to me just how quickly time does go. At the start of the month, there are no color poems. And then, suddenly, there are 26. Time. A little bit of work each day adds up. If you are Writing the Rainbow with me, perhaps your color for today will connect with a different poem you have written before, maybe a color poem and maybe not. But know this - poems do partner themselves sometimes. It happens. If you're new to writing poetry, you might wish to look at the line breaks in this poem. Why do you think I ended the different lines as I did? I tried a few different versions, one with lines doubly long, but this sounded best to me in the end. And please don't miss the links to all kinds of Poetry Month goodness up there in my upper left sidebar. Happy twenty-sixth day of National Poetry Month! This collection could easily be a novel-in-verse. I can imagine sitting next to Miss Johnson and enjoying her orange red tomatoes. Not until summer, but as you said, time can go fast, and summer will be here soon.